DDC USA specializes in the intelligent processing of mission-critical data for some of the nation's most successful companies. 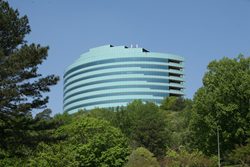 DDC USA, a division of global business process outsourcing leader The DDC Group, is launching a new, week-long office health program, entitled "Spring Into Fitness," March 14-18, to celebrate its active team and inspire its neighbors of the Atlanta business community. DDC USA specializes in the intelligent processing of mission-critical data for some of the nation's most successful companies, representing industries such as aerospace manufacturing, healthcare revenue cycle management, nonprofit organizations, and marketing intelligence agencies. "Our goal is to educate, inform and inspire," said Lory Wilson, DDC USA office manager. "And of course, have fun!" The team participated in its inaugural "Healthy Heart" Valentine's Day breakfast last month, and during the brainstorming phase decided to simultaneously plan a multi-day event that would incorporate valuable information on nutrition and fitness. "Many Atlantans sit in traffic for an hour or so in the morning commute, hunch over at their desks all day, eat an unhealthy lunch, and then sit in traffic again to get home," explained Wilson. "DDC USA does not fit that mundane, old-fashioned mold." During the week, the team will focus on four main topics: Understanding healthy nutrition; the importance of exercise; the importance of sleep; and reducing stress. Activities include, but are not limited to: A latinrobics class, healthy meal recipe exchange, desk exercises, and blood pressure measurements. "Our team already sets the bar very high for corporate culture in Atlanta businesses," added Wilson. "We are excited to add 'healthy lifestyle' as a standard for our office environment." For more information, please visit (http://www.theddcgroup.com/), follow us on Twitter (https://twitter.com/The_DDC_Group), find us on Facebook (https://www.facebook.com/pages/The-DDC-Group/608667002491682) and connect with us on LinkedIn (http://www.linkedin.com/company/ddc-usa).